Bathrooms, like kitchens are a huge selling point in your home. Here are several ways you can add value to yours through quick updates that make a big difference. Swapping outdated fixtures can go a long way in upgrading a bathroom. Go for popular finishes like satin or brushed nickel that pair well with most tile. Chrome is also a classic option. Especially for shared bathrooms, installing an extra sink is a great move. As a general rule, you need a minimum of 60 inches to comfortably accommodate 2 sinks. Vessel or undermount styles will make the most of limited counter space. 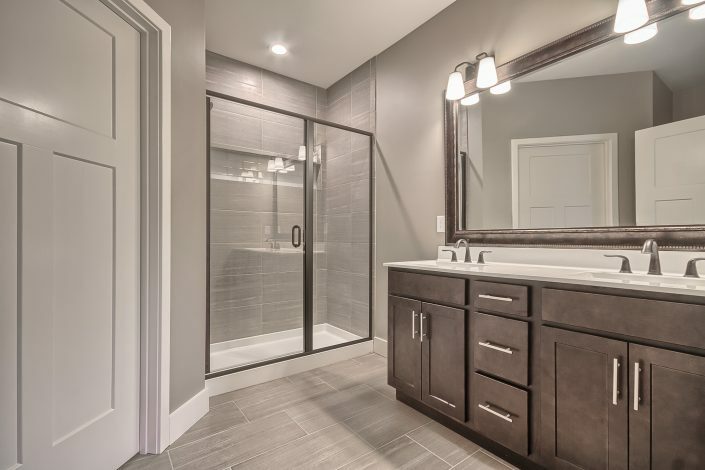 Swap out contractor-grade fixtures for something more stylish and functional. For a layered effect, include overhead and task lighting at the vanity mirror. Install a dimmer for added versatility and control. Consider how much storage you need when selecting vanities and cabinetry. If space is tight, go vertical with shallow shelves or upper cabinets. Keep paint colors light and neutral in the bathroom for a clean, fresh look. These colors will give the space a light, airy feel and will contrast nicely with the white fixtures. If you have a tub, transform it into a spa-like destination with bath products and accessories. Keep decorative towels, aromatic soaps, bath salts and candles within reach. Add plants in designer vessels. If your bathroom has a tiny, outdated tub, consider replacing it with a spacious shower. Include thoughtful features like built-in shelves, storage and benches. Whether it’s on the floor, tub or shower, choose your tile wisely. Stick with classic designs, neutral colors and a pattern you can live with for a long time. Large tiles can help a small room feel more spacious and diagonal installation can help a narrow room appear wider. Replacing a dated showerhead with a new one is an easy, affordable fix. Consider adding luxury features for a spa-like feel. Natural light in a bathroom is always good. Even a small transom window can provide a significant amount of light and help a small bathroom feel airy and bright. A deep clean of every nook and cranny can really refresh the overall appearance of your bathroom. Scrub residue off of cabinets, fixtures and grout lines.